Hugh Jackman read some three dozen books on PT Barnum to prepare for the title role. Rebecca Ferguson's voice was dubbed by Loren Allred. Ferguson had studied music and admitted that she can carry a tune but since Jenny Lind, her character, is considered the best singer in the world, dubbing her voice would be in service of the movie. However, in order to get into the role, Ferguson insisted on singing the song in front of the extras while filming. This film was a dream project for Hugh Jackman since 2009. 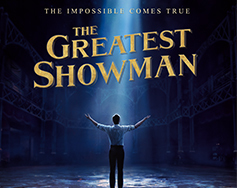 Many of the costumes used in the ensemble circus scenes at the beginning and end of the film were borrowed from Feld Entertainment, the current owners of Ringling Brothers and Barnum & Bailey Circus, and were used in productions of "The Greatest Show on Earth."